I awoke to remarkably few biting insects. I was hoping this was an omen for an epic day on the Allagash River. I had my usual breakfast of Grandy Oats and Adventurous Joe Coffee and packed my stuff up to go put in. Bob Johnston, the ranger, gave me the weather forecast and wished me well. As promised, Bob doubled the flow in the river and I was ready to go. There was one canoe with two men that went earlier and there were a couple of canoes to follow. So my run would be completely solo without seeing any other boats on the river – perfect! When kneeling in thigh straps and wielding my Werner spoon blade paddle, the Wenonah Voyager feels and behaves much like a heavy Wildwater C-1. I feel very much at home taking downriver lines in rapids with this boat. With ample water in the river, I had a rollicking run down Chase Rapids. I wanted to put in a bunch of miles and ended up doing something north of 40 miles this day. At Round Pond I saw that the ranger at the station was working on her guide canoe so I stopped for a chat. We spoke for 15 minutes or so and then she asked me why I look so familiar. I told her that she looked familiar to me as well. Then she asked me where I was from and if I was John Connelly. I told her I am and then she told me that she used to work for me as a whitewater raft guide. Her name is Barbara Pinot and she worked for me when she was in college during the 1980s. We spent the next several minutes reflecting on good times and talking about the people we worked with and what they are doing now. This was a most unexpected and fun meeting in the middle of absolutely nowhere. This has been happening to me a lot and I like it! I spent the night at my absolute favorite Allagash campsite, which is called Five Fingers Brook West. I slept like a baby! The night must have been in the mid 30s and there was not a bug to be found in the morning. Imagine my disappointment! I made breakfast, drank my coffee and got on the water, looking forward to another big day. Like the day before, it was in the 70s but gratefully, there was less wind. I portaged 40-foot Allagash falls and had lunch there. What a special place and to have it all to myself with nobody else around was a very rare treat. I continued to the town of Allagash Village and joined the St. John River. I would have several more miles to go for my destination of Pelletier’s Campground and St. Francis. I was struck by how wide and how huge the St. John River is at this point. Solid streams fall into the St. John and the banks are incredibly high. There is still snow and ice on the sides of the river but it is deposited 20 to 30 feet above the water level. It’s clear that this is a huge and powerful river when it’s running high. 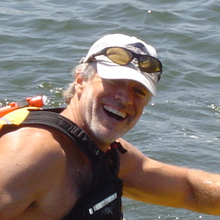 I am grateful to have a good flow for running the rapids and getting through the slow stretches. But I am also grateful that there is not so much water as to make this a stressful paddle. I arrive at Pelletier’s Campground in St. Francis but no one is around. This is very typical of my early-season paddle. Nothing is open, nobody is around, no other people are paddling, the people who I run into think I’m a little crazy and I have to say that I like it. 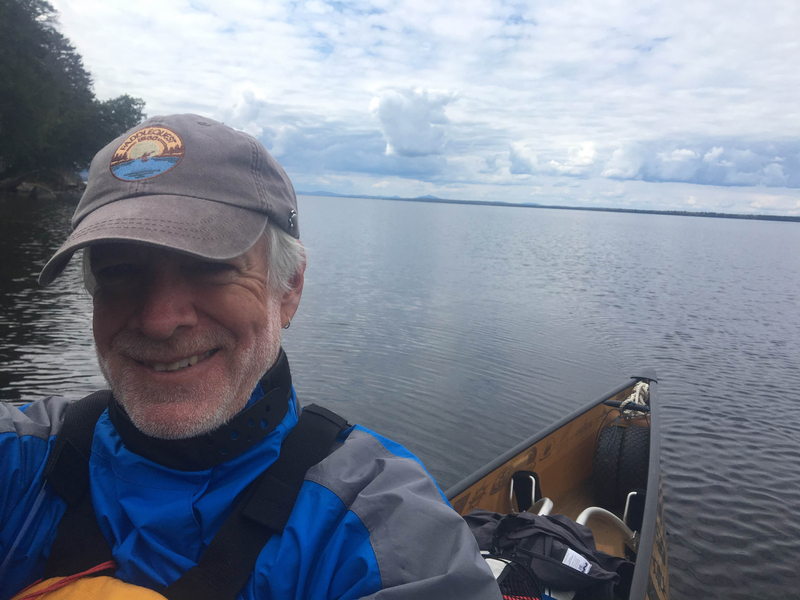 One thing about early-season paddling on the Northern Forest Canoe Trail is that there is plenty of water. I wanted to make sure that I had plenty of water for the fast run off rivers on the trail. Luckily I have the water I needed to be able to run the Nohegan in the South branch of the Dead. As well, there were other streams that required decent run off in order to paddle them. One downside of plenty of water, is when traveling upstream. I was fortunate to be able to Eddy hop up many of the rapids that I hear people have to track up or carry around. However, there were sections of the Androscoggin River in New Hampshire, for example, where the velocity of flow combined with the depth, combined with no in stream boulders to provide Eddys for hopping up the rapid, required me to portage. Another beautiful thing about early-season paddling is that the waterfowl are nesting, so I saw many mothers on nests and as time went on I began seeing yellow gosling babies being herded around by their mothers. The papers were absolutely deafening throughout. It seems like this time of year is all about the next generation. While I was paddling up the Androscoggin River in New Hampshire, I saw some activity and a side cove. So I quietly paddled over to see what was going on and was absolutely amazed. There was a bald eagle attacking a Canada goose. The goose was on the water and clearly defending its nest or its mate. The eagle would drive with talons extended but the goose screaming at the top of its lungs, flapping its wings, and running across the water straight at the eagle, caused the eagle to break off its attack. I witnessed this occur three times and then the eagle retreated to the top of a white pine tree. Kudos to the goose and to its tenacity and determination to ward off the predator. It gave me a newfound respect for geese and nature’s parents. At some point on the West branch of the Penobscot I realized that I would not be seeing very many moose. The reason being that my early-season trip is before the aquatic plants are available to be eaten by the moose. So basically, the restaurant is not yet open and therefore, there are no customers. The only reason for a moose to be in the river, on the pond or lake would be to cross it. Quite frankly I have seen thousands of moose in the wild and even took one out with my Isuzu Trooper. Given the choice between a high water and seeing no moose, or low-water and seeing lots of moose, I definitely choose the high water. Thanks for this Allagash to St John update … enjoyed imagining you there … sans bugs and high water! You go …!! !